Description: BNSF roadswitcher R-NEB4101-19T heads north from Pacific Junction on the BNSF Council Bluffs Subdivision. 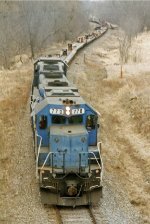 Description: BNSF roadswitcher R-NEB4101-19T heads north from Pacific Junction on the BNSF Council Bluffs Subdivision - Highway 34 overpass. Description: Sitting in the Barstow yard. Description: Still sitting in the Barstow yard all by itself. Description: BNSF North La Crosse switch engine.